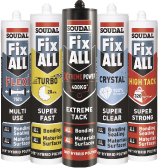 Soudal Gun and Foam Cleaner is a ready-to-use cleaning aerosol can for use on Soudafoam Gun and Soudal foams. Cleans and partially dissolves fresh and uncured PU foam and foam stains. Also necessary for the cleaning and maintenance of PU foam guns. Fitted with regular threaded adapter for foam guns, and includes spray attachment. Do not use foam cleaner to remove excess foam in an application area. Wait for the foam to cure and cut with knife instead. Cleaner has no effect on cured foams. Always clean the gun after use with this cleaner to maintain the quality of the gun. Cleaner may have limited effect to clean PU foam stains on clothing. Can be stored up to 24 months in unopened packaging in a cool, dry storage place with temperatures between 5 to 25C. For the full list of recommendations, please consult the Technical Data Sheets and Material Safety Data Sheets as provided.